Acute unstable scaphoid waist fractures which can be reduced closed. Fractures in which adequate reduction cannot be achieved via a closed manner. Scaphoid nonunions with sclerosis, cystic changes, pseudarthrosis, avascular necrosis, and humpback deformities. 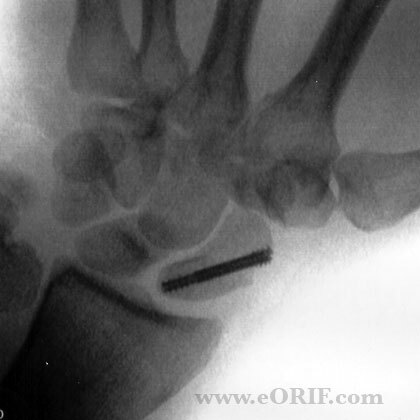 Screws must be placed in the central third of both poles of the scaphoid for greatest stability, and rapidity of fracture healing. Proximal pole fractures should be approached dorsally. Waist fractures may be approached dorsally or volarly. Distal fractures are best approached volarly. Displaced fractures may be reduced via: volar traction-assisted approach; the dorsal minimal incision approach, with manual reduction as the guidewire is advanced; or the dorsal approach with arthroscopy-assisted reduction. Distal approach: proximal aiming point is the ulnar proximal corner of the scaphoid at the insertion of the scapholunate ligament. C-arm positioned on opposite side of the patient. Pronation and suppination of the forearm allows complete 180° fluorscopic visualization of the scaphoid. Perfrom fluoroscopic exam of the wrist. Evaluate for occult carpal fracture, great arc injury, scapolunate instability. Wrist suspended from the thumb finger trap. Insert 12-gauge needle into the scaphotrapezial joint and then pass guidewire down the needle. Double-checking guidewire position with multiple radiographic views. Ensure screw is fully buried beneath the articular cartilage. Screw lenght should be 4mm shorter than the measured length of the scaphoid. Failure to recognize concomitant injuries. Post-op: Place in volar thumb spica splint. 7-10 Days: If rigid fixation in good bone was achieved start controlled motion program with a removable splint and range-of-motion and gripping exercises. 100% union at an average of twelve weeks. Fractures treated earlier heal more quickly than those treated later. (Slade JF, Gutow AP, Geissler WB: JBJS 2002; 84A (suppl 20): 21-36). Screw fixation: 7wks to union, 8 weeks return to work. Cast: 12 weeks to union, 15 weeks return to work. No significant difference in wrist ROM or grip strength at 2 years. (Bond CD, JBJS 2001; 83A: 483-488).